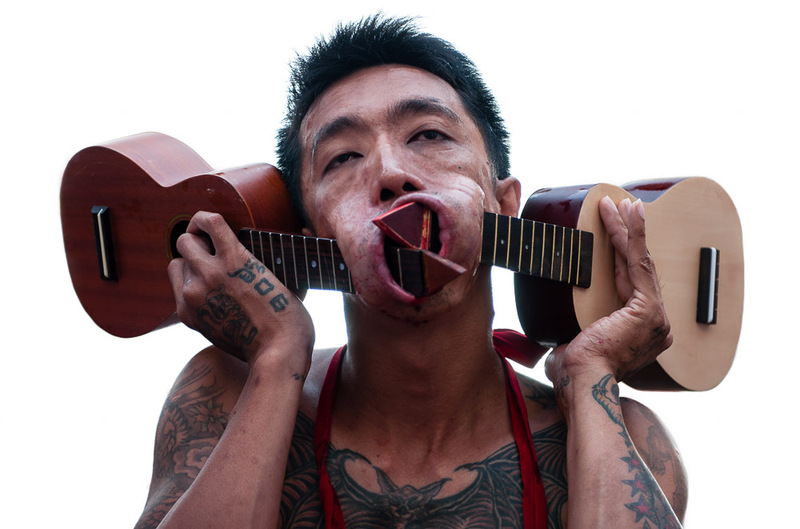 Ok, we will be honest with you… We thought that disregarding the acoustic ukulele in favour of the electric ukulele was about as extreme as it could get. We were under the impression that punking out with a uke was the most radical thing since mohawks. We thought that the only thing more entertaining would be jumping out of a aeroplane with a uke singing ‘jump’ by Van Halen was as rock and roll as it got. That was, of course, until we saw this. 2 ukulele’s? In your Face. Guillaume Megevand’s photo from the Vegetarian Festival in Phuket, Thailand. When we saw this photo by Guillaume Megevand we were truly gobsmacked. Guillaume is a photographer from Geneva, Switzerland who has been living in Bangkok for more than a year shooting editorial jobs. Recently he was out shooting in Phuket and came across this crazy chap in the photo and a bunch of his friends, all piercing themselves with bizarre and interesting objects, and he let us bring this photo in particular to you. It was shot during the Vegetarian Festival, on of the most extreme festival in the world. During 10 days, the chinese population of the island follows a vegetarian diet and performs sacred rituals in the different chinese temples of the city. The devotees get pierced by all different kind of objects going from a gun to a beach umbrella. They also walk over hot coals or climb up ladders with rungs made of knife blades. As extreme as it gets with 2 ukes, we think, but if you have seen anything crazier, please let us know! If you’d like to see more strange objects shoved through human flesh, or more of the interesting sites of Thailand, check out Guillaume’s photography portfolio, because you know… it is about as radical as you could get with your own body!